Renault Scenic/Grand Scenic III 2.0D dCi 2009 timing chain change instructions and replacement inteval. Full guide! Camshaft holding/alignment tool – No.Mot-1769. Crankshaft pulley holding tool – No.Mot-1770. Crankshaft timing pin – No.Mot-1766. Flywheel locking tool – No.Mot-1431. Two-piece inlet camshaft gear alignment tool – No.Mot-1773. Ensure engine at TDC on No.1 cylinder. Turn crankshaft clockwise until crankshaft keyway aligned with hole  &  . Fit crankshaft timing pin  . Turn crankshaft anti-clockwise until it stops against timing pin. Ensure crankshaft keyway at 12 o’clock position  . Ensure groove in exhaust camshaft is horizontal  . Large section above groove facing upwards  . Ensure timing mark on inlet camshaft gear aligned at 12 o’clock position  . Slacken exhaust camshaft sprocket bolts  . Insert 3 mm pin to lock tensioner plunger  . Remove chain tensioner, tensioner rail and chain guide. 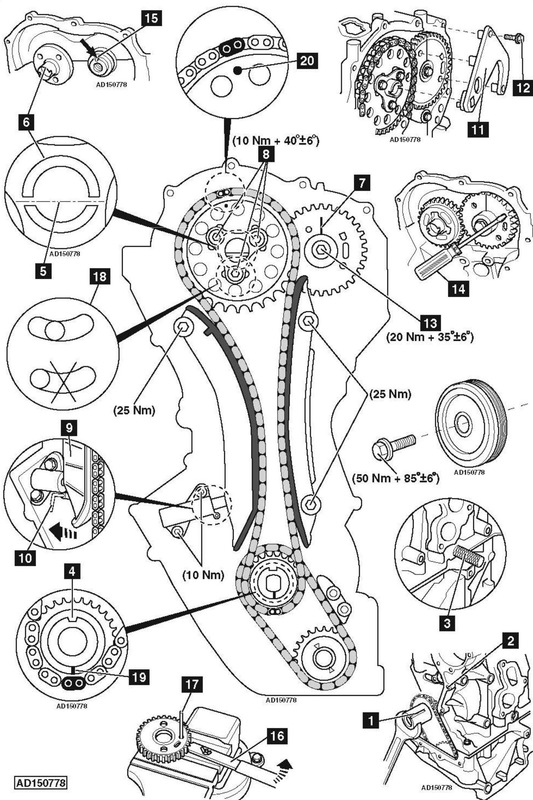 Remove timing chain, exhaust camshaft sprocket and crankshaft sprocket as an assembly. Fit camshaft holding/alignment tool  . Secure tool with M6 bolt  . Slacken inlet camshaft gear bolt  . Remove camshaft holding/alignment tool  . Align gear teeth of two-piece inlet camshaft gear. Use screwdriver  . Remove two-piece inlet camshaft gear. Ensure groove in inlet camshaft at 12 o’clock position  . Ensure crankshaft timing pin correctly fitted  . Align two-piece inlet camshaft gear on inlet camshaft gear alignment tool and lock with suitable pin  &  . Fit two-piece inlet camshaft gear. Ensure timing mark on inlet camshaft gear aligned at 12 o’clock position  . Tighten inlet camshaft gear bolt finger tight  . NOTE: Ensure threaded holes positioned in centre of slots  . Remove locking pin from two-piece inlet camshaft gear  . Fit camshaft holding/alignment tool  . Fit new inlet camshaft gear bolt  . Tightening torque: 20 Nm + 35°±6°. Remove camshaft holding/alignment tool  . Ensure groove in exhaust camshaft is horizontal  . Large section above groove facing upwards  . Ensure crankshaft keyway at 12 o’clock position  . Install chain guide. Align coloured chain link with crankshaft sprocket timing mark  . Align coloured chain link with camshaft sprocket timing mark  . Install timing chain, exhaust camshaft sprocket and crankshaft sprocket as an assembly. Tighten exhaust camshaft sprocket bolts finger tight  . Ensure camshaft sprocket turns freely. Install timing chain tensioner rail. Install chain tensioner. Remove chain tensioner locking pin  . Ensure camshaft holding/alignment tool can be fitted. If not, repeat adjustment procedure of camshafts. Fit new exhaust camshaft sprocket bolts  . Tightening torque: 10 Nm + 40°±6°. Remove camshaft holding/alignment tool  . Remove crankshaft timing pin  . Fit new crankshaft pulley centre bolt. Tightening torque: 50 Nm + 85°±6°. NOTE: DO NOT start engine without auxiliary drive belt fitted as damage may occur to crankshaft pulley.